On Sunday, a mural of the moment the teen slammed the egg into the back of Anning’s head appeared in central Melbourne. 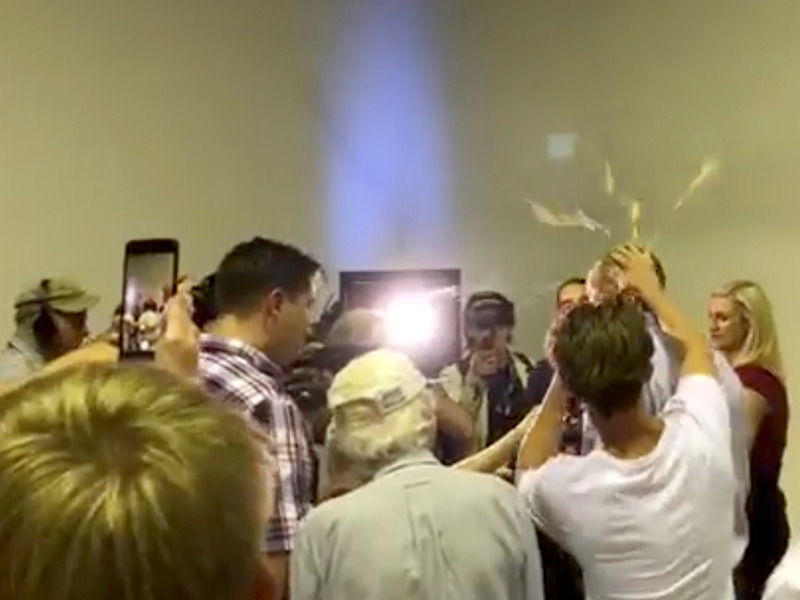 Video footage of the incident, which was posted to senator Fraser Anning’s Facebook page, shows the teen cracking an egg over his head. The senator responded by punching the 17-year-old teen, who was then tackled to the ground by Anning’s supporters in the crowd. The 17-year-old identified as William Connelly quickly became an overnight sensation and was coined “egg boy” by people on social media. According to Australian news service Nine News, Connelly amassed nearly 500,000 followers on Instagram, before closing his social media accounts. “If you’re on your way to work in Melbourne CBD this morning, here’s a gift for you in Hosier Lane,” the artist captioned the photo. “He got a slap across the face, which is what his mother should have given him long ago,” the senator said on Monday according to Nine News. “When somebody cracks you in the back of your head, you react and defend yourself.